Ojo Technology is a California Multiple Award Schedules (CMAS) certified supplier of security systems and services. That means state agencies and local governments are assured they are paying a fair and reasonable prices for our products and services. CMAS agreements are based on Federal General Services Administration (GSA) multiple award schedule contracts which have been competitively assessed and negotiated. 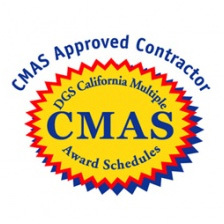 CMAS agreements comply with California procurement codes, guidelines, and policies, and provide for the highest level of contractual protection. Besides state agencies who can use CMAS?